If you haven’t had the opportunity to get acquainted with Catoctin Creek, a small distillery out of Virginia, get thee to the liquor store. Buy a bottle and put some of that bottle in your mouth. Catoctin Creek is a family owned operation that’s won a ridiculous amount of awards, from multiple Good Food accolades to Double Gold at the San Francisco World Spirits competition. Everything that goes into their booze is sourced locally, certified organic and even meets kosher standards. The distillery is even solar powered. So, there’s that. 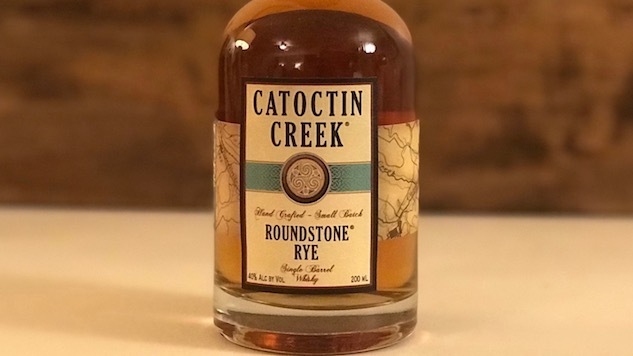 Catoctin Creek makes a variety of spirits, but the one that makes whiskey nerds drool is Roundstone Rye, a 100% rye that’s made from scratch, beginning to end, in Catoctin Creek’s Virginia distillery. They put out a few versions of Roundstone, basically tweaking the proof for different bottles, but if you’re looking for somewhere to start, pick up a bottle of their flagship 80-proof single barrel Roundstone Rye. The whiskey isn’t aged long (less than two years) so if you’re a stickler for well-aged booze, you might be wary. But Roundstone is a testament to the notion that quality ingredients have as much to do with a whiskey’s success as its time in a barrel. The nose is caramel and oak and the barrel comes through on the sip with some pleasant tannins. This rye has an almost buttery mouthfeel right off the bat that slowly gives way to the signature peppery spice you’d expect from a 100% rye whiskey. The spice lingers on the tongue after the sip dissipates, but by no means is this a “hot” whiskey. The alcohol burn is low to nonexistent. This is one of those rare whiskies that I’d say doesn’t improve with a chunk of ice or drop of water. You don’t need to dilute this whiskey to open it up; It’s plenty open all on its own without any help. The ice just thins it out too much and dilutes the wonderful toffee and butter notes. In a world where much of the best whiskey is either made from one of the big-hitters in Kentucky, or sourced from a warehouse in Indiana, it’s refreshing to come across a bottle like Roundstone Rye. There are no shortcuts here. Just craftsmanship. And it shows.